It may seem silly to review a simple water bottle, but if you've ever spent four hours on the trail with leaky bottles, you know how much a good bottle actually matters. All it takes is an occasional drip to chill your hands or legs on a winter run, and in summer the drips can advance from simple annoyance to mental torture by mile 20 - turning your legs into a sticky, bug-catching mess all the while. At Run Junkie, we've tried a huge variety of bottles over the years - from the typical bike store offerings, to the typical running store offerings. And hands down, the best bottle we've tried to date is Ultimate Direction's Classic Bottle (site). What makes this bottle so great? Simple: It just doesn't leak. Year after year; dishwasher cycle after dishwasher cycle; it seals like an airlock. We know people who can baby other bottles to good performance with hand washing (read "Nathans" (site)), but the convenience of a bottle that stands up to the old Whirlpool is key. It's hard enough to find time to run, let alone hand wash water bottles. 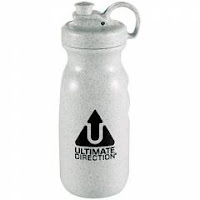 And while all of Ultimate Direction's bottles may work as well as the Classic, we just can't warm up to their bottles with the creepy rubber "kicker" valve. We much prefer the standard tops of the Classic. The relatively recent move to opaque sides was a bit strange. It makes it hard to keep track of how much Perpetuem you've downed. But that's a small nick in an otherwise great, if basic, bottle. I'm glad we can agree that UD makes the highest quality bottles out there. I throw some other brands away as soon as I get them.